You might think that horses just ride around in trailers with their asses hanging out for the world to see. But not thoroughbreds. They travel in style, especially after they win the Kentucky Derby. This weekend is the Preakness Stakes, one of the biggest horse races of the year and part of the Triple Crown. California Chrome won the Kentucky Derby and now has to run the Preakness on Saturday. 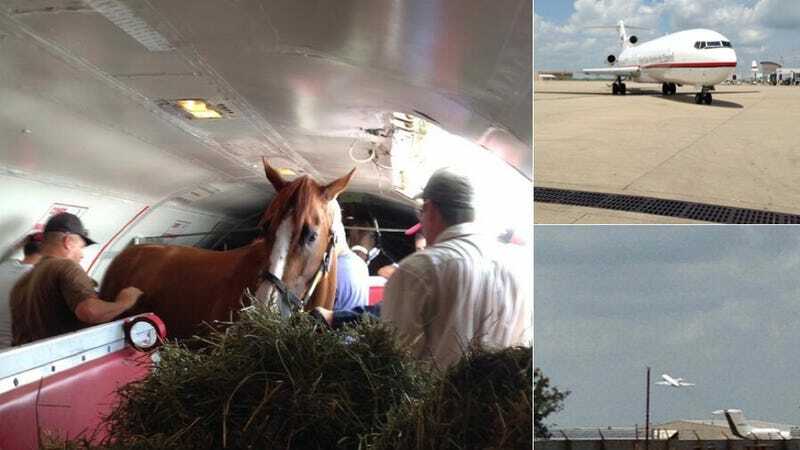 Instead of a truck, California Chrome gets to eschew the ground for the sky and what amounts to first class in a flight from Kentucky to Baltimore. This is precious cargo, so the pilot better be extra careful that the reigning Kentucky Derby champ isn't injured.